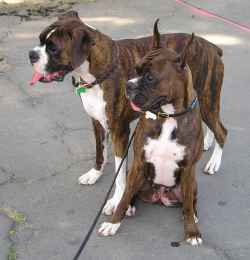 Boxers are a breed of stocky, medium-sized, short-haired dog with a fawn or brindled coat and square-jawed muzzle. Boxers can be almost completely white, but these are rare. They were developed in Germany in the mid-1800s as a multi-purpose dog principally for guarding, police working and escorts. These dogs are boisterous, active, playful and very intelligent. They have lost of stamina and speed which characterises there working life. Early obedience training is recommended. Cropping of the tail and ears remains popular, although it is now prohibited in most European breed standards. An adult boxer typically weighs about 31 kg and is about 58 cm tall at the withers.